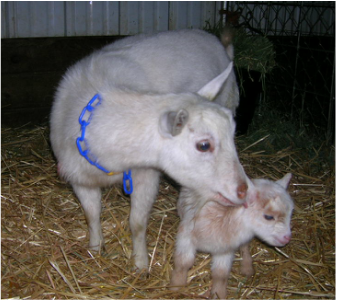 2Chix Farm is home to the delightful Sans Gene herd of Nigerian Dwarf dairy goats. Nigerian Dwarfs are amazing little goats! Their small size and gentle disposition make them easy to handle and keep. They give a surprising amount of milk for their size, 1-2 quarts per day (sometimes more! ), and are known for delicious, sweet tasting milk with very high butterfat (6-8%, sometimes more!) content. We strive toward excellence in conformation, dairy type, milk production, longevity, and vigor in our breeding program. Our herd is small, so all of our goats receive lots of individual love and attention. We test for and have always been negative for CAE, and our foundation stock came from CAE-negative tested herds. We have also tested for CL and Johne's, with all test results negative. Keeping our goats happy and healthy is our first priority! Our Nigerian Dwarf goats are registered with American Dairy Goat Association (ADGA). We enjoy showing and letting the girls "strut their stuff" in the show ring, attending as many of our area ADGA shows as we can. We believe the Nigerian Dwarf is and should be a productive dairy goat, so we milk our girls regularly and were on DHIR test 2011 - 2016. Life forced a break from continuous milk test with the Nigerian herd for now, though we hope to return to DHIR test again in 2019. In the meantime, we hope to do a few official one day milking competitions, and we are always happy to provide an honest assessment of how our does milk. The herd participated in ADGA linear appraisal in 2013, 2014, and 2016, 2018!